Vegetable oil is processed from the specific parts of the plants, which are placed under pressure to get its oil extracted. It has wide application in households, food processing industries, cosmetic products. As per the taste and health consciousness, type of vegetable oil is considered for its use in preparing food. Edible oils are considered healthier than the animal fats that contain unsaturated fatty acids. Thus, global edible oil market amounted to USD 84.6 billion in 2016, with maximum contribution from palm oil, mustard oil and canola oil. Further, vegetable oils are also used in industries for manufacturing of biofuels, which is contributing towards sustainability but it also impacts the food supply as the raw materials in the form of feed stock are diverted for making biofuel. Vegetable oil processing emits large amount of product losses and emission of effluents that is required to be treated, thus there is need for advanced and efficient production facility to reduce pollutant burden. As per the production of vegetable oils, coconut oil has huge preference all over world, with Indonesia being the largest coconut oil producer, aiding the growth of global vegetable oil market. Goldstein Research analyst forecast that the global vegetable oil market size is set to reach 252 million metric ton by 2025, growing at a CAGR of 4.20% over the forecast period. Supply of raw materials, innovation in vegetable oil processing and its applications and government support are the major factors impacting the growth of global vegetable oil market. 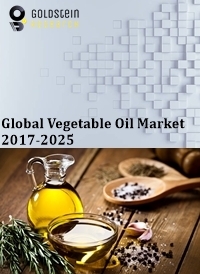 The report covers the present ground scenario and the future growth prospects of the vegetable oil market for 2017-2025 along with the global sales and global revenue of vegetable oil. We calculated the market size and revenue share on the basis of revenue generated from major players across the globe. We have forecast the market on the basis of manufacturers, suppliers and distributors, raw material suppliers, revenue of industries using vegetable oil. On the basis of product type, palm oil accounted for largest market share of 46.2% in 2017 of global vegetable oil market. Palm oil is used in cooking as well as in making biofuels. Palm oil has 10% contribution in biofuel, thus having high industrial demand. Canola oil market is growing at a rate of 3.91%, as it has high health benefits i.e. helps in reducing inflammatory diseases like heart disease and cancer and contains heart-healthy monosaturated fats. Vegetable oil market outlook 2017-2025, has been prepared based on an in-depth market analysis from industry experts. The report covers the competitive landscape and current position of major players in the vegetable oil market. The report also includes porter’s five force model, SWOT analysis, company profiling, business strategies of market players and their business models. Global vegetable oil market report also recognizes value chain analysis to understand the cost differentiation to provide competitive advantage to the existing and new entry players. With the advent of sustainability in fuel market, the trend of using vegetable oil in making biofuels is growing. Vegetable oil fuel can be used directly in a diesel vehicle either modified or unmodified form. Usable vegetable oil includes sunflower oil, peanut oil, canola oil, palm oil. The growth in allied industries using vegetable oils such as food services industries and cosmetic industry and the household consumption of vegetable oil, where the demand is highest, is driving the growth of global vegetable oil market. To meet these demands there is adoption of advanced technologies and equipment to efficiently manufacture vegetable oil with lower wastage. The government regulation poses the challenge for vegetable oil manufacturers. Basic regulation that impact the food processing industry are commercial registration, taxation, labor standards and social security contributions, health and safety requirements, and specific operational permits and licenses. Based on geography, Asia-Pacific accounted for largest market share of 48.3% in 2017 of global vegetable oil market. Asia-Pacific region is the largest producer of vegetable oils, which are mostly exported to various parts of the world. Europe vegetable oil market is expected to grow at a CAGR of 3.7% over the forecast period. Europe is the major consumer of vegetable oils, with rising application in vegetable oil fuels on the back of Europe economy’s shift towards sustainability. Global Vegetable oil market report comprises of the following companies as the key players in the Vegetable oil market: Associated British Foods, CHS, Cargill, Bunge, Wilmar, Dow Agrosciences, ACH, Unilever, Adams, ADM, Beidahuang, Carapelli Firenze, Savola. What is the revenue of Vegetable oil market in 2016-17 and what would be the expected demand over the forecasted period?